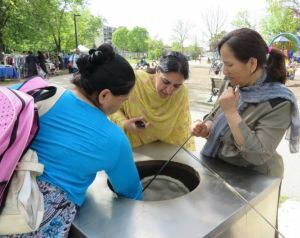 The tandoor oven was installed at R.V.Burgess Park in 2013 and first used regularly in 2014. 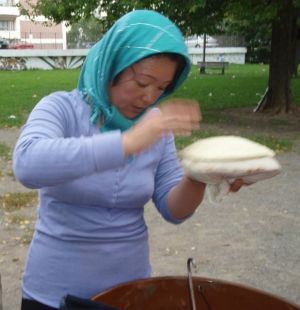 Here is a short Youtube video showing naan bread being made at the park in September 2014. 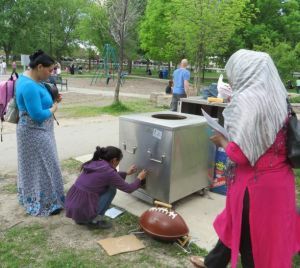 2011 - The Thorncliffe Park Women's Committee first made plans to locate a tandoor oven in RV Burgess Park, for use during community events such as their summer bazaars and fresh food markets. 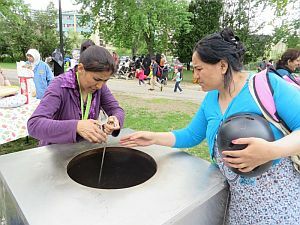 It is an open air cooking device traditionally used in many cultures ranging from the Middle East to Central and South Asia. 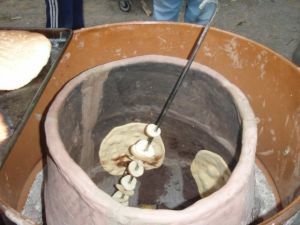 In a tall clay pot with a fire at the bottom, insulated to keep the heat in, various foods such as bread, grilled/roasted meat and vegetables are made. 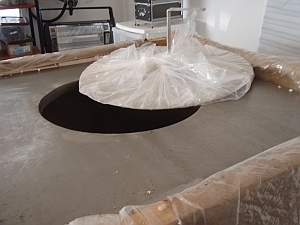 On March 15, five of us went to Oakville to have a look at the tandoor ovens manufactures by Mainra Traders. The owner was very nice and showed us all the details for the tandoors he manufactures in India. 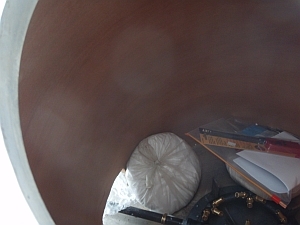 The ceramic inside is covered by a steel box; the whole thing, he says, weighs about 700 lbs. The price would be about $1600 plus HST. 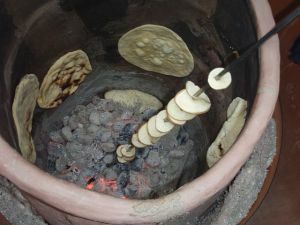 The tandoor uses charcoal. 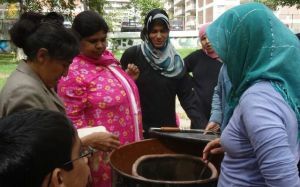 Summer 2010 Thorncliffe Park Womens Committee (TPWC) made a tandoor with clay in a barrel. The first one broke while being made. The second attempt was a success, and bread and chicken were made. 4/24/2011 Meeting at Amy's. Amy, Sabina, Asya, Zakia, Jutta, Mayssan, Pia, Yo. Tandoor proposal planned. 5/20/2011 Traditional Tawa cooking demonstration (Tawa event correspondence) See the illustrated story. 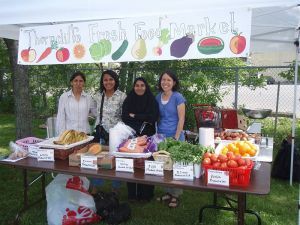 5/26/2011 Fresh Food Markets Grant submitted (Fresh Food Markets Grant Application). 6/6/2011 Meeting with Roger Macklin on possible site (Meeting at the tandoor site with Roger Macklin) It was decided that the city would fully fund the building of the tandoor. 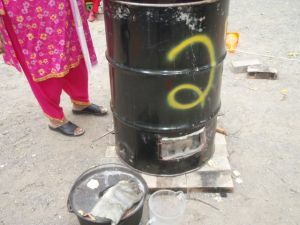 6/30/2011 Mainra traders sends a note that their tandoor stock is low and an order should be made soon. No word from Roger yet. 7/26/2011 portable tandoor purchased. 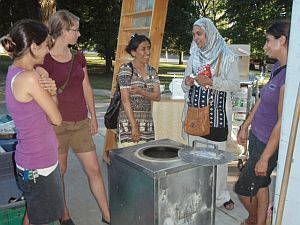 Curing the Portable Tandoor, July 27, 2011? 9/29/2011 Bake oven policy meeting at Dufferin. Diane Stevenson, Amanda, Wendy. 10/11/2011 Parks Committee meeting. Bake oven policy is deferred again until the November 22 meeting. 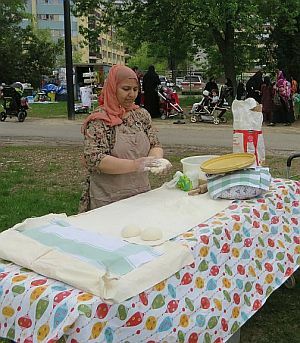 10/29/2011 Eid Bazaar at R. V. Burgess Park. 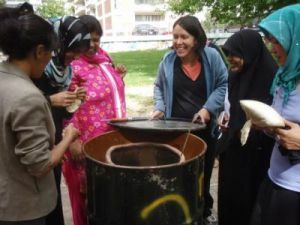 11/9/2011 Meeting with the Food Strategy members at TNO. Barbara Emanuel, Seodnha Keown, Ayal (Sorauren Park), TPWC, CELOS. Then a long time of back and forth or (mostly) silence.